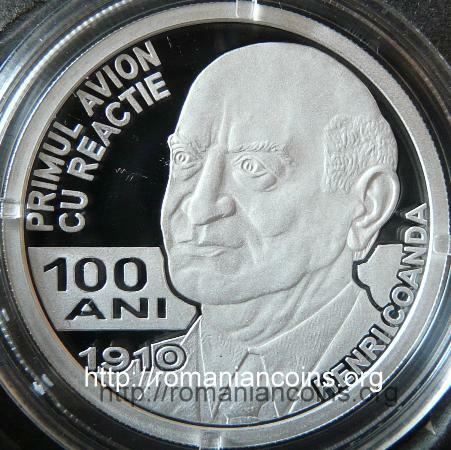 Obverse: coat of arms of Romania, year 2010, face value "100 LEI", ROMANIA, the airplane built by Coandă and the outline of the airplane, from bird's-eye view Reverse: bust of the inventor and HENRI COANDA on the left shoulder, over a frosted band "100 ANI" meaning "100 YEARS", year 1910, inscription "PRIMUL AVION CU REACTIE" meaning "FIRST JET AIRPLANE"
Henri Marie Coandă was born on 7th of June 1886 at Bucharest. Officer of the Romanian Army, his father Constantin Coandă (1857-1932), was at that time captain and worked at the General Staff of the Army. His mother was daughter of a French medic. Constantin Coandă advanced to the rank of general. He also had an outstanding political career. In 1918 he was for a short period - a month only - prime minister (president of the Council of ministers - he took the function from Alexandru Marghiloman and passed it to Ion I.C. Brătianu). As a curiosity, the first road traffic law in Romania, voted and promulgated by king Ferdinand in year 1921, bears the name of general Coandă, in his quality of president of the Senate of Romania (the regulation for applying this law stipulated that inside the population centers the maximum speed of an automobile was to be 12 km per hour!). Henri followed "Sfîntul Sava" (Saint Sabbas) high school from Bucharest and the Military high school from Iaşi - that he graduated as valedictorian, with the rank of sergeant major. After military studies at Bucharest he became artillery officer. He followed technical studies in Germany, Belgium and France. In 1908 he presented at Spa, in Belgium, the Coandă-Joachim glider. Between 1911 and 1914 he worked as chief designer at Bristol Aeroplane Company from Great Britain (at that time the company was named British and Colonial Aeroplane Co.), where Bristol-Coandă airplanes were made. At the military airplane competition that took place in 1911 in France, at Reims, Coandă participated with a plane having two engines and a single propeller. This competition was won by Charles Terres Weymann (1889-1976), aeroplane racing pilot and (later) businessman. In the Flight magazine from October 20th 1910 Weymann is presented as buyer of Coandă 1910 airplane (in the magazine are presented two pictures of the plane). Then he moved to France, as engineer at Delaunay-Belleville factory at Saint-Denis. This firm was renown for its luxury cars, for locomotives and for steam boilers for ships. During the war airplanes were produced here for the French government. During these years Coandă designed three types of planes, one of them having been a single seat artillery fire spotter biplane. Henri was married to Marguerite Coandă, born Lecca. In 1940, after the fall of France, Coandă remained in Paris, where he lived. It is supposed that in 1942-1943 he designed for the Germans a sledge with unconventional propulsion, intended to be used as ambulance on the eastern front. Between 1961 and 1965 Coandă was consultant at Huyck Research Center in Stamford, Connecticut, company that worked for the US Marine Corps. He was also member of the Romanian Academy. Engineer and inventor, Henri Coandă is known by the effect bearing his name today. In 1970 he returned to Romania. As an official recognition of his merits, he was appointed advisor with the rank of minister of the State Council of the Socialist Republic of Romania. Henri Coandă was a true "indisciplined genius". He obtained outstanding results in many scientific and technical domains, obtaining several hundred patents in various countries. The plane of Henri Coandă was shown at the 2nd International Aeronautical Exhibition of Paris in 1910. It was equipped with the Coandă invented reactor motor or motorjet, baptized by its inventor “turbopropeller”. Most probably Coandă chose this name for commercial reasons, as the engine did not have any turbine in its composition. In the airplane presentation pamphlet from 1910 Coandă recommended himself as "engineer-aeronaut, mechanic, frigorist, electrician, bachelor of mechanical, physical, metallurgical and constructive sciences of the faculties of Paris and Liège". In 1911 Coandă obtained one Swiss and one British patent for his "propeller", as a matter of fact only for the centrifugal compressor part. Coandă used in his plane several important novelties: the propulsion system, a lower wing, shorter than the upper wing, polished and varnished plywood instead of fabric for the wings, the wings' connection with fuselage by steel struts. The gasoline tank was housed inside the upper wing. The wing profile was chosen after aerodynamic studies. The motorjet comprised a four-cylinder internal combustion engine (50 horsepower at 1000 revolutions per minute, water-cooled, made by Clerget) that turned, through a gearbox, the centrifugal compressor (that worked at 4000 rpm). The fuel, mixed with the air given by the compressor, burned inside two combustion chambers placed on both sides of the plane. The hot gas flowed and expanded inside two nozzles in order to produce the reaction force needed for propulsion. Inside the nose of the plane there was a sort of diaphragm that allowed the regulation of the air mass flow that entered the engine and the thus the developed force. The static thrust of the engine was 220 kilogram-force, more than the value that could be obtained if the Clerget engire would have driven directly a propeller. Two steering wheels were used for piloting the airplane. The steering wheels moved four rudders. Two levers were used to modify the opening of the diaphragm and the revolution speed of the internal combustion engine. On December 16th 1910, at Issy-les-Moulineaux, Coandă tried his aircraft. He only wanted to maneuver the airplane on the ground using the powerplant. Panic-stricken by the flames emerging from the jet nozzles and by the fact he actually had lifted away from the ground, Henri Coandă lost the controls of the plane, that crashed down and caught fire. The first jet reaction flight though had already taken place! Henri Coandă was engineer, not pilot. Here is Henri Coandă's own description of the event: "[...] the apparatus took off, even too swift, it was not my fault, but at a moment slid on a wing and crashed and burned completely. It was my luck that I didn't have a hood, and I was not tied to the chair, so I was thrown outside and I didn't burn" (Constantin C. Gheorghiu, Invenţii şi priorităţi româneşti în aviaţie (Romanian Inventions an Priorities in Aviation), Albatros Printing House, Bucharest, 1979, letter to the author of the book, facsimiled). Due to the lack of written contemporary testimonies, several persons consider that Henri Coandă never tested his airplane and so he never flew his machine. Selected references: several notes from the British magazine "Flight" published between 1910 and 1973 and available on the Internet, the book of Constantin Gheorghiu cited above, the patents obtained by Coandă in 1911 for his "propeller". 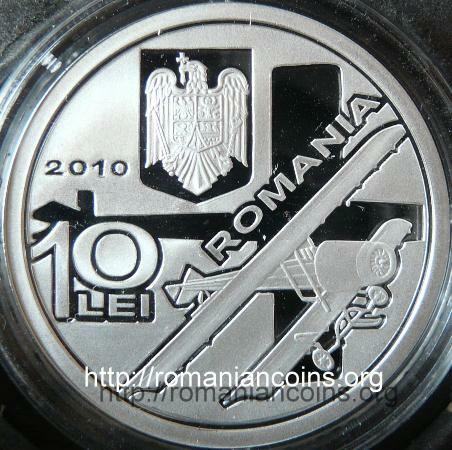 Coandă 1910 airplane and its inventor also appear on a coin from the 50 lei silver 2001 set, dedicated to the Romanian aviation pioneers.